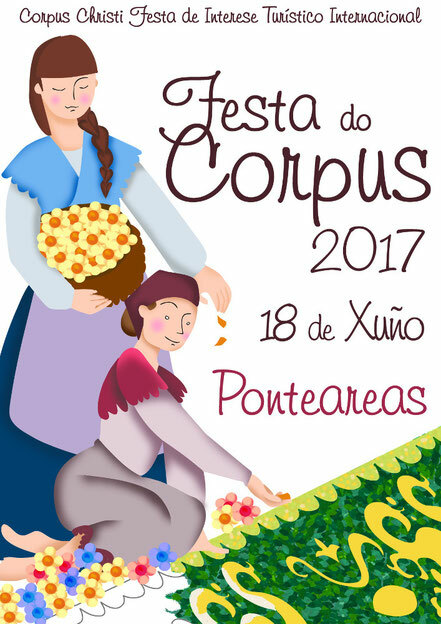 The village of Ponteareas in the south of the province of Pontevedra, reached special renown for the celebration of the feast of Corpus Christi, where neighbors prepare for the passage of the procession of the Blessed Sacrament artistic carpets of natural flowers. It is a collective work that expresses the popular culture of the people of Ponteareas that, over the years, knew how to preserve and promote this celebration, recognized as the "Fiesta of International Tourist Interest". On the Sunday of the Corpus there are more than 20 carpets that fill the streets and squares of Ponteareas in a profusion of color, creativity and beauty that beguile to own and visitors. 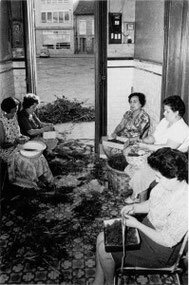 More than a kilometer of carpets with thousands of flowers, bushes and shrubs, and deshojadas carefully mixed to obtain an authentic work of art ephemeral. In Galicia we know from the Middle Ages the use of vegetal elements in the liturgies of the Corpus, as well in the Cathedral of Santiago de Compostela sprinkled fennel for their ships in this festivity in the 16th century, custom extended later by numerous places of Galicia. In Ponteareas lack a clear reference on the date on which it began to adorn our streets, as a result, the use of an immemorial tradition is forced. The existence of a priestly brotherhood of the archpriesthood under the patronage of the Blessed that annually celebrated solemn cults, the Confraternity of the Most Holy of the parish of San Miguel that I had on this day their main acts of worship, the Foreign Contribution (some speak of a judge canary resident in Ponteareas whose wife introduced the tradition of carpeting) are elements which can explain why that arises in Ponteareas alfombrista this tradition and not in other places. In the second half of the 19th century already adorned our streets where spread flowers and plants for the passage of the Eucharistic procession, without making any drawing. So in 1857, Calle San Gregorio had extended straight out on the floor, aromatic herbs and flowers more than usual on the solemnity of the day. However, the popular voice places the origin in the neighbors of the popularly known as "Calle de Abaixo" or Real street and from there spread to other areas of the villa. With the passing of the years you want to cover the entirety of the streets, it begins to use serraduras stained with dyes of different shades that were combined with the traditional giraldas, myrtles, ferns, etc. These serraduras were obtained in the many hardwood that existed in the area and was mixed with the aniline in big barrels with water, but the combination was declining in the first decades of the 20th century. By this time they begin to be accomplished the first drawings, mostly of geometric character and with the design of the frizzes, borders, etc. serraduras should cover with the cobbled streets before placing the floral decoration. The feast was characterized by spontaneity, was the result of the enthusiasm and devotion of the neighbors themselves. From several weeks before men, women and children went out to the mountains, fields and gardens in search of material (first myrtle, mimosa, arnica, etc., as election day approached, flowers) that women and children deshojaban patiently in the portals of the houses of the processional route, while the men were designing, in secret, the ornamentation of the carpet. No institution promoted or supported this effort, nor anyone foreign approached to contemplate it, through the night in which all were unanimous in the clothing industry. In this situation you will reach the year 1947 in which the feast of Corpus begins a new stage. From 1945 leaves of organizing this celebration the corresponding butler of the Confraternity of the Most Holy assuming this task a commission of neighbors. In 1947 this Commission Luis Salgueiro, José Casasnovas and Gabino Porto, betting on the dissemination of this feast, until then tied to the local level. Radio interviews, reports, editing of material (the magazine "Cry"), etc. are innovative initiatives that promote. The combination of these measures makes the feast of Corpus acquires a dimension unusual until then, with the influx of thousands of people to Ponteareas to contemplate his With the influx of thousands of people to Ponteareas to contemplate your carpets. To the point that in 1968 this festival has been declared of National Tourist Interest". The growing influx of visitors is parallel to a growing quality of our carpets, each time the drawings, borders, borders, etc. acquire a more artistic dimension. There are also the figurative themes, linked to the religious themes or Galician, where they began to qualify on the basis of flowers and leaves and ends with seeds, grindings, etc. 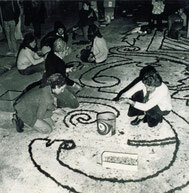 Today it is very important to the municipal support that provides the material (myrtle, mimosa, cocas of Eucalyptus, etc.,) but remain anonymous work and delivered to the neighbors the true architects of the "marvelous creation" which are our carpets of flowers. But a special space in the history of the carpeted floors ponteareanos have carpets of flowers carried out beyond our villa. Particular note should be made in the Plaza del Obradoiro square in Santiago de Compostela on 9 November 1982 on the occasion of the first trip of Pope John Paul II to Spain, or also made in his honor at the Plaza de Santa Ana in the Vatican on 2 February 1983. Special mention to those made in Caracas (1985 and 1998), Seville (1992), Buenos Aires (1992), Bahia (1993), etc. without forgetting that annually make the neighbors of A Coruña in the sister of the Orotava Valley since 1984. This authentic monument heritage of faith and the popular culture of the ponteareanos is, at present, the sign of identity more closely felt by all the residents of this village and one of the richest expressions of the cultural heritage of Galicia. The recognition of the work and wisdom in the preparation of floral carpets had its last recognition in 2009 with the declaration of the feast of Corpus Christi in Ponteareas as Fiesta of International Tourist Interest. This distinction was one of the reasons that led to the City Council of A Coruña to organize in 2010 the third International Congress of Ephemeral Art and in which Valencia had the greatest projection throughout its history at the international level and in which met in Ponteareas delegations from various cities around the world, showing their floral art. At the same time, Ponteareas displayed his art in the preparation of floral carpets in several places of the world and sometimes as important as in the year 2010 in the visit of His Holiness Pope Benedict XVI because of the Jacobean Year, where thousands of visitors of all nationalities were able to see the beautiful carpet made by the neighbors of Valencia on the occasion of its presence in Santiago de Compostela.